I must confess that I wasn’t much of a PC gamer when FTL came out. I stumbled upon a Youtube series of it a little while after its release, which led to my immediate purchase and many hours of gleeful space battles. I never did beat it, but that didn’t stop me enjoying its thrilling gameplay. 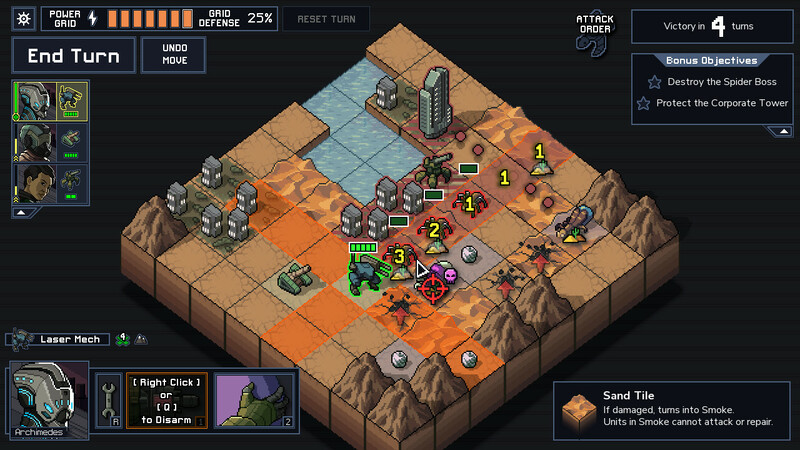 Now, nearly five years later, Subset Games’ follow up into the breach has arrived and, well, it’s even better. Actually, it’s one of the best games of the year. You’re a time-traveller, sent to save the world from an alien threat that lurks below the surface. The Vek, as they are known, are seemingly intent on wiping out the human race and you and your group of mech pilots are all that stand in the way of our extinction. It all sounds very serious, doesn’t it? 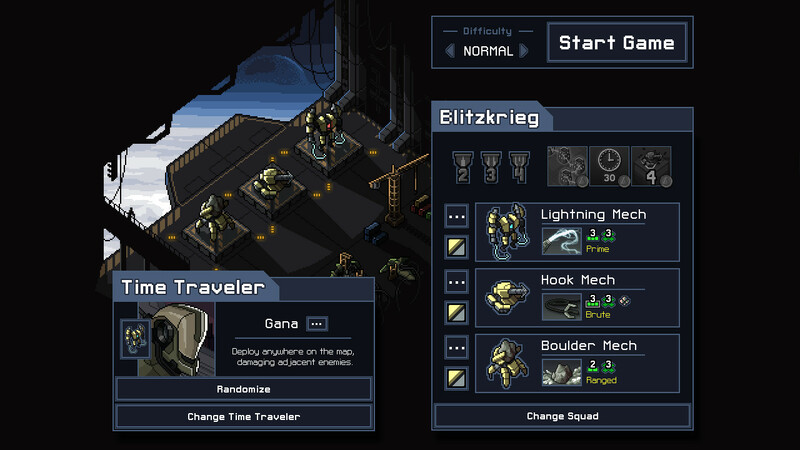 Much like FTL’s humble starting ship, you’ll begin with a basic set of mechs. From there, you’ll be transported to the first of four islands, each with their own unique landscape and dangers. After a brief introduction, you’ll select your first battle zone and that’s where things get really good, really fast. Each map is a simple eight-by-eight square grid, onto which you will drop your three mechs. Placement is key to getting a good start and knowing each mech’s abilities is crucial to surviving each encounter with the Vek. This is where the unique aspect lies. Each battle is turn-based, but there are a limited number of turns before the Vek retreat underground to fight another day. The enemy often won’t even target your team, as its focus is on destroying the civilian structures that litter each battlefield, or reducing key structures to rubble. For every building lost, so shall you lose a unit of power, and once your power reaches zero the Vek wins and the world is lost. That’s not necessarily the end, though. Just because that timeline is screwed, doesn’t mean you can’t send someone to another timeline to try again, armed with greater knowledge of the enemy. You’ll never experience the same fight twice, partly due to the randomly generated nature of each map, but also because the enemy strategy will always change too. At the beginning of each turn, the Vek will manoeuvre its giant insects into place and set up its attacks – this is a reactionary game, so you’re meant to use this to your advantage. One might target a building with a ranged shot, but knocking it out of place will send that shot along a different path, even if that path happens to lead straight through another Vek. It’s always satisfying when you get a Vek to kill one of its own. Always. But sometimes you’ll have no other choice but to use your mech as a shield, which only adds to the almost puzzle-like nature of each strategic encounter. It’s not simply about wiping out your opponent, it’s about protecting civilians. Choosing the right strategy isn’t limited to the battlefield either, as each island is split into separate missions that offer unique bonuses upon completion. The most common reward is reputation, which can be spent on upgrades at the end of each island, but you can also earn extra power units to keep your bid to save the world alive. Lastly, you can earn reactor cores that offer a boost in power to a chosen mech, allowing for extra features to be brought online. This, coupled with the ability to buy new weapons with reputation stars, means that you can outfit your mechs with serious firepower, or simply with more protection to help withstand attacks. You can only take on a limited number of missions on each island before the Vek will attempt to destroy its main headquarters, meaning that you’ll sometimes have to choose between the possibility of extra reactor cores or more power to keep the world alive for another day. Into the Breach is a simple game, with simple combat mechanics and fast-paced gameplay that keeps things flowing at a steady rate. This makes it fun, which isn’t something often associated with strategy gaming, if you’re honest with yourself. The thing is, its simplicity hides tremendous depth and its randomly generated nature means that you can keep playing for as long as you want. I can see myself still playing this at the end of the year, which is incredibly rare for a strategy title. At the end of every playthrough, regardless of whether you succeed or have to try again with a new timeline, you’ll earn reward points that can be used to unlock new mech squads too, each with their own unique units and abilities. Or put together your own squad for an added challenge. Speaking of challenge, it’s time to address the elephant in the room: the difficulty. Unfortunately, much like FTL, the normal difficulty level is ridiculously tough. So much so that you’ll almost certainly need to play it on easy for quite a while, but at least that offers a more balanced experience for most players to enjoy, without removing all the challenge from the battles. Normal difficulty increases the number of turns before each mission ends, but it also makes the enemy smarter, more numerous and above all, stronger. It makes for a very, very painful introduction to the game, but heed my advice and start on easy and you’ll be having fun in no time. Once you’ve beaten the game, maybe even a few times, you might be ready to move things up a notch. 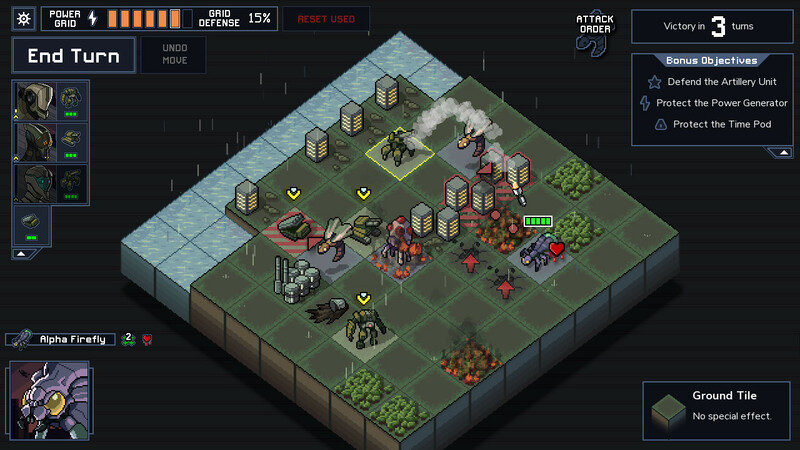 Into the Breach is something special. Okay, that’s already obvious from the first paragraph of this review, but it bears repeating. 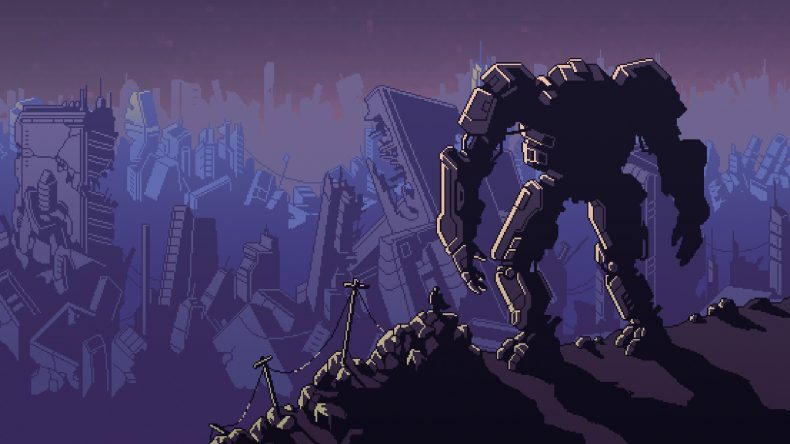 Its gorgeous, almost-cute pixel art belies a combat system that packs one hell of a punch, and its simple, turn-based action hides a depth that even the most sophisticated strategy games rarely offer. Uncovering all these hidden joys will reward you with one of the best games of the year; possibly one of the best strategy games ever made, quite frankly. Certainly the most fun one.